If proof were ever needed that every dog needs ‘the right home’, it’s Peter’s story. Born in 1941, Peter’s first owner, Mrs Audrey Stables found him, like many Collies, to be a handful. She commented that Peter had two talents; his innate ability to disregard any command she gave him, and his ability to systematically destroy her house! Mrs Stables decided that she couldn’t cope with Peter, but thought that being such an intelligent breed, he may be of some use in a different environment. After some thought, Peter was conscripted to try and help the war effort. Officially known as “Rescue Dog No. 2664/9288 Peter”, he was trained by Archie Knight, a Search and Rescue trainer. 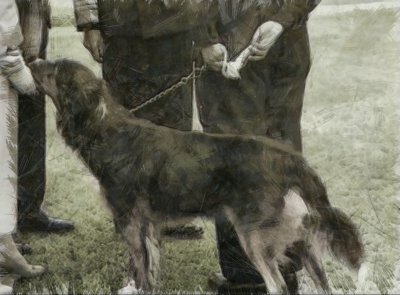 After his training was completed and Peter passed the relevant tests, he was put into service in early 1945 as an official Search and Rescue dog. In other incidents, Peter rescued six people who had been trapped in a single air raid. Peter didn’t just save humans, on one occasion Peter even managed to locate and save an African Grey Parrot. It seemed there were no limits to Peter’s talents. After the end of the war, Peter and his handler were presented to the King and Queen at the Civil Defence Stand–Down parade in Hyde Park, London. Peter received a Royal Seal of Approval not many have received over the years – the future Queen Elizabeth the II kissed Peter on the nose! Despite no longer being needed in urban search and rescue at the end of the war, Peter’s skills were transferred to Mountain Rescue techniques, and was often used to teach other handlers and dogs. After his heroic adventures, Peter returned home to Mrs Stables, and moved to a PDSA animal sanctuary before he died in 1952.